10” and 5” flue riser available without shelf. Oven Door: Counter balanced with heavy duty hinges, Oven Interior: Double sided, full porcelain enamel oven cavity for superior cleanability and corrosion protection. Coved corners for easy cleaning and enhanced airflow eliminating hot/cold spots. 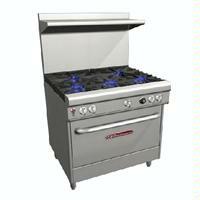 45,000 BTU NAT oven with standing pilot and thermostat range of 175 F to 550F . Porcelain enamel interior measuring 14” high x 26” wide x 26.5” deep. Full sized pans fit both ways. One rack with two position side rails.